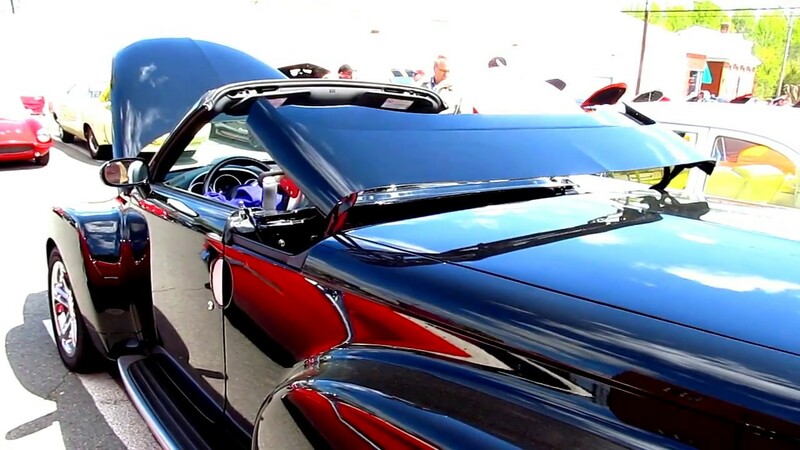 Starting with this great FVS convertible GIF from many months ago . I did some convertible research and sketching today. It looks like the ventilation louvers will be the hardest to resolve. Most photos are from eye level. The transition from the two outer bumps to the crease at the inside will also be challenging. I'm hoping a solution will become more apparent as I model. I'm using the SSR hard top as my inspiration as to how the two pieces will slide down behind the cockpit. I also have to assume that the rear camera on the top simply becomes inoperable when the top is stowed. I know there is still a backup camera above the license plate. Since the roof is stored vertically behind the cabin, I will assume that there can be a glass window over the engine here too. Last edited by John; 04-01-2019, 11:46 AM. How do Chaz and FVS incorporate that vented, cooling system, as in the hatch of the coupe, that GM patented in the retractable hardtop?? Earlier HT convertible pictures which are helpful; thanks to Corvette_Nut for reminding us of these earlier picture. Very helpful for us to see the buttress shape. Last edited by John; 02-03-2019, 11:38 PM. Two more convertible pictures (these taken last September at the Nurburgring). In conditions of bright sunlight, an LCD screen is going to be harder to see with eyes that are adapted to the sunlight. And may not be useable. I believe the camera will fold away with the roof, and the virtual mirror revert to being a conventional one. Sightlines should be improved with the roof down. Since the roof is stored vertically behind the cabin, I will assume that there can be a glass window over the engine here too. That would be very nice - I'd like to be able to see the LT2 "under glass" for the Roadster. Chazcron has suggested the C8 HT retraction could be similar to the SSR hartop mechanism, which seems possible, and allows for a glass window over the engine. Last edited by Mobius; 02-04-2019, 08:38 AM. Chaz and FVS ... nice work fellas ... I remember the FVS gif well and anticipate Chaz's new render as he progresses. These views keep me interested. thx guys. In the photos in post #3, it looks like there are probably vents in about the same location as Chazchron drew them, shown in post #1. Certainly improved, but with those big flying buttresses rear 3/4 vision is still going to be restricted. But heck, Ferrari and others make it work, so GM can, too. One of the (many) great things about driving my C7 'vert top down is the unlimited rear vision, though. I'll be sorry to give that up. Yes, I too drive a convertible now. Looking at the side elevation I think it's possible that the mirror can be mounted high enough to just "see" over the tops of the buttresses. But for sure the "shoulder check", which I always do before a lane change, is going to be severely compromised when moving to the right. We are going to need a really prominent blind spot warning. My current Golf has it but not prominent enough for my liking. That would be really nice. If my memory serves me right (? ), there is one Spyder that has that capability. I love it! We can all look like Thomas Magnum at a quarter the cost....? Just rid of that ridulous rear spoiler or at the very least make it optional..
does anyone look at that rear spoiler at gM and say to other gm executives...that spoiler looks good?